I'll keep this brief and if anyone has any questions please feel free to e-mail. See Project Registry for contact information. Well it's been about 14 months build time and gathering materials along the way from ebay and the great people at the local West Marine store. A few sea trials to get the motor running the way I want it and I'm having a BLAST. This being my first attempt at building a boat, I've learned a lot along the way. First, if you're after a specific look, add 25% to the build time and 50% to the cost. Would I do it again? YOU BET. I've never been one to accept praise for the things I've done but the comments I've received from the many people who've seen it sure makes the time spent in the shop all worth it. As you can see I went for the longer version (11') This gave me a nice place for the battery and fuel tank as well as plenty of stowage for the paddle, life jackets, fenders, dock lines and even a little room for a basket lunch without cluttering the cockpit. 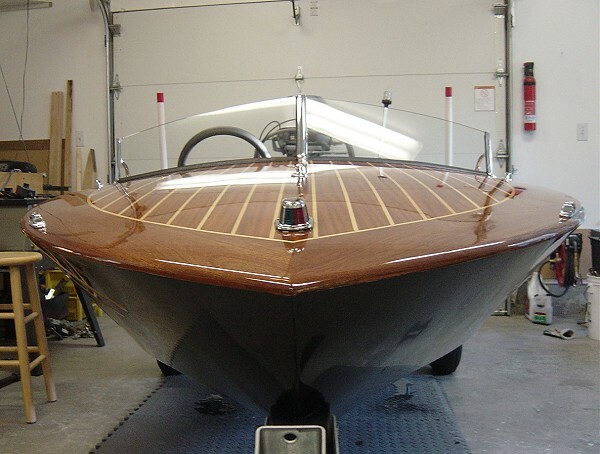 Hull materials are Marine Mahogany ply over White Oak frame. 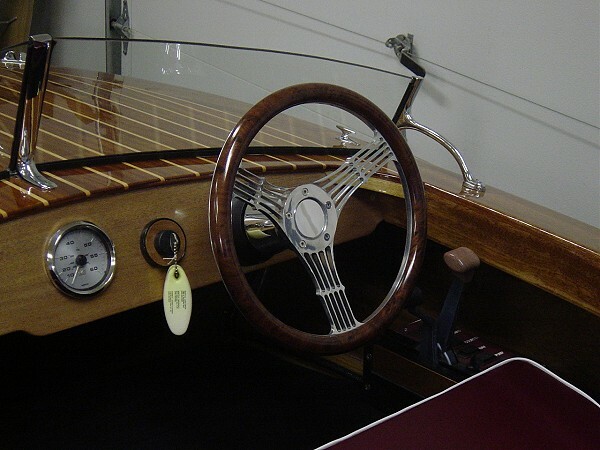 The instrument panel and decking is Ribbon Mahogany with White Maple inlay surrounded by Philippine mahogany. The underlayment is the same plywood used in building Pygmy kayaks. On the hull I used West System with a 6 oz. cloth, and sprayed 4 coats of Jet Black Interlux Perfection two-part polyurethane. The deck has 2 coats of West System and 6 coats of Epiphanies varnish (will be adding minimum of 2 more coats this winter). The amenities include Teleflex rack system steering, a 500 gph bilge pump, navigation and courtesy lighting in the cockpit and storage area as well as a horn. I know everyone was saying weight, weight I'm adding too much weight. Well the total added weight of the electrical system was minimal and has not outweighed the comfort and convenience. Add all that to a comfortable seat and "Wow". 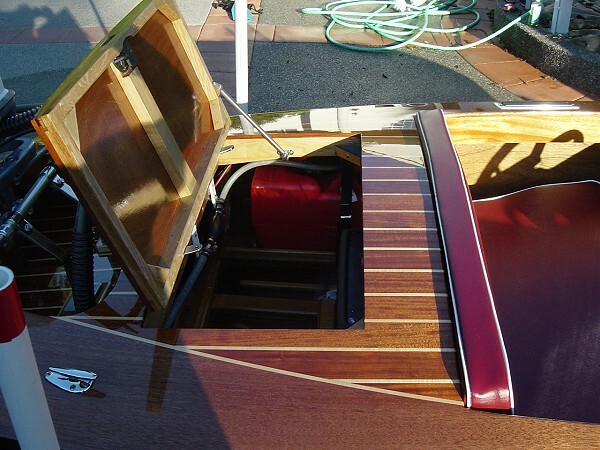 Hanging on the transom is a 1977 25 hp electric start, short shaft Evinrude with a Sting Ray Jr. Ten hp more than suggested, but the transom was beefed up to support and an inspection is being accomplished every time I use it for now. I had to get a little creative in many of the areas due to space restrictions. 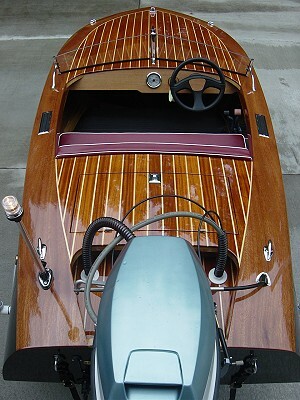 One was mounting the throttle/shift controller on the deck to keep it out of the way and the biggest was routing the steering cable through the deck and connecting it to the older style motor. The steering brackets I made (as you can see in the picture) attach to the splash well and yes those are modified bimini stainless steel tube slides that attach to the steering tube. 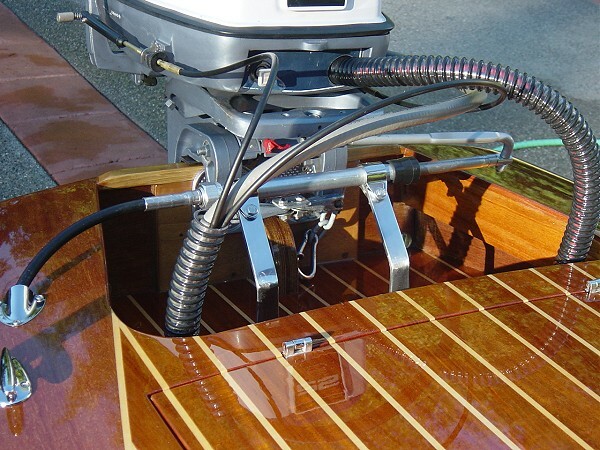 The motor can only be pivoted if the link arm is disconnected, but this has not been a problem because the boat sits high enough on the trailer to leave the motor down when trailering. Performance has been more than acceptable for me. With my buddy and I in the boat (approx 360 lbs. 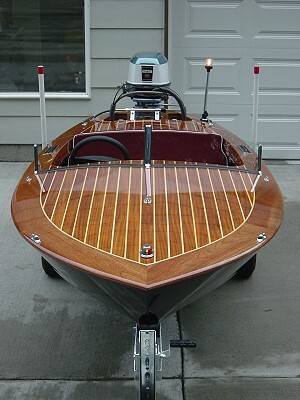 ), it jumps out of the water and cruises at 25+ mph on the gauge; my wife and I @ 28 and me alone @ 32 (Plenty fast enough in an 11' boat). Not sure, but if I played with it, maybe 35. (No reason to go there). I have added the fin to reduce skidding and the look of the boat required a new steering wheel. I have lots of construction photos and sketches for anyone wishing to see them. Attached are just a few completed photos.